Hi friends! 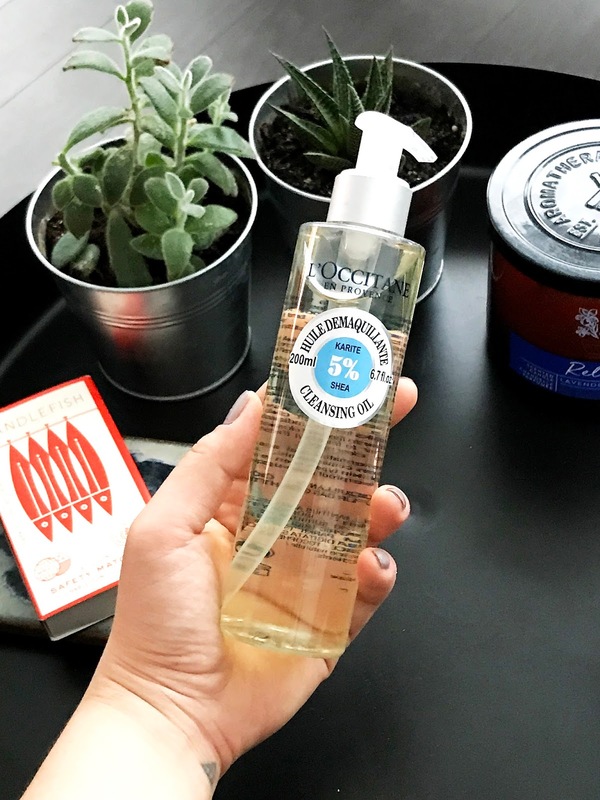 As promised, today I have a quick review on the L'Occitane Shea Cleansing Oil. I have been using a cleansing oil to remove my makeup for years and it has literally changed how I clean my face at the end of the day. While I do love the cheaper alternative (The Body Shop's Chamomile Cleansing Oil), I wanted to splurge and treat myself to a higher end product and compare the differences. The L'Occitane Shea Cleansing Oil comes in a 200mL bottle and retails for $29.00 CAD. It's only slightly more costly than some cleansing oils but I would say it's definitely in the mid-tier in terms of price. The base is of sunflower oil, and is super liquidy but feels very silky on the skin. The Shea Cleansing Oil does a fantastic job of removing makeup, even waterproof makeup. It has that shea butter scent you would expect if you've used other products from the shea butter line, and because of that ingredient, it also adds a touch of hydration. Like most cleansing oils, it emulsifies well when mixed with water, and even when it's washed off, there is no greasy residue. Of course, I do like to use a regular facial cleanser afterwards to make sure everything is off, but the cleansing oil definitely does its job in removing all of my makeup. Overall, I did really like the Shea Cleansing Oil. Would I purchase it again? Yes, but only if I feel like treating myself because while it did its job and I don't have any complaints, I would say I would rather spend less money on The Body Shop Chamomile Cleansing Oil because they really both do the same thing. Both are also ethically produced and use high quality ingredients, so I love that about them but for an every day product, I just have a preference. Have you tried the L'Occitane Shea Cleansing Oil? What did you think about it? Also, do you do the double-cleanse method? Oh! I just bought the Shea one (I think) during the Sephora sale. I didn't even know there was another kind. I'm glad to hear you like it because I was on the fence about the price tag, but I've been wanting to try something new. Thanks for the run down!